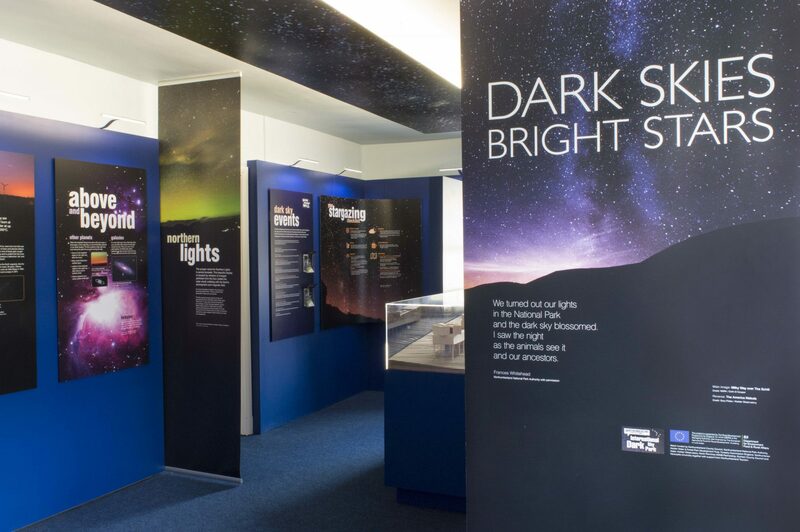 Earlier this year, I worked with Abound Design who were commissioned by Kielder Water & Forest Park Development Trust, on behalf of the Animating Dark Skies Project Partnership, to produce indoor interpretation at their Kielder Castle and Tower Knowe Visitor Centre sites about the area’s ‘Dark Sky’ status and what that means, and to encourage visitors to the area to look at the night skies. The project opened for the start of the 2016 Season, but it’s not been until now that I’ve actually had the chance to visit. My role on the project involved researching astronomy content and producing exhibition text and related hands-on activities. 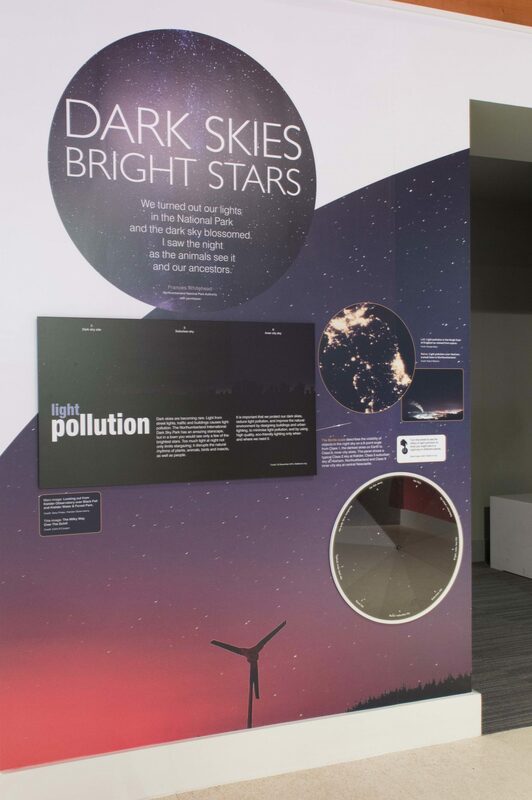 Light pollution was a key concept to communicate and the lack of light pollution can be a very powerful experience for city-dwellers visiting Kielder. 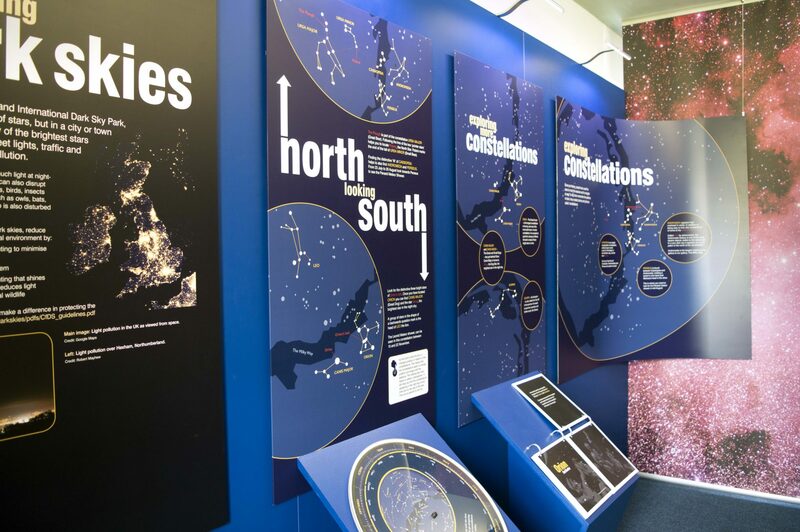 Something I was very keen to include in the exhibition was a large-format Planisphere. This is a map of the constellations as they appear at the night sky which rotates to line up the date and time and show would-be stargazers what to look out for. We also included large-scale flip books telling the Myths of some of the best known constellations and showing the images they relate to alongside the actual shapes of the stars in the sky. In this photo you can see a simple orrery we had built in order to show how and why the moon appears to change shape through the month. 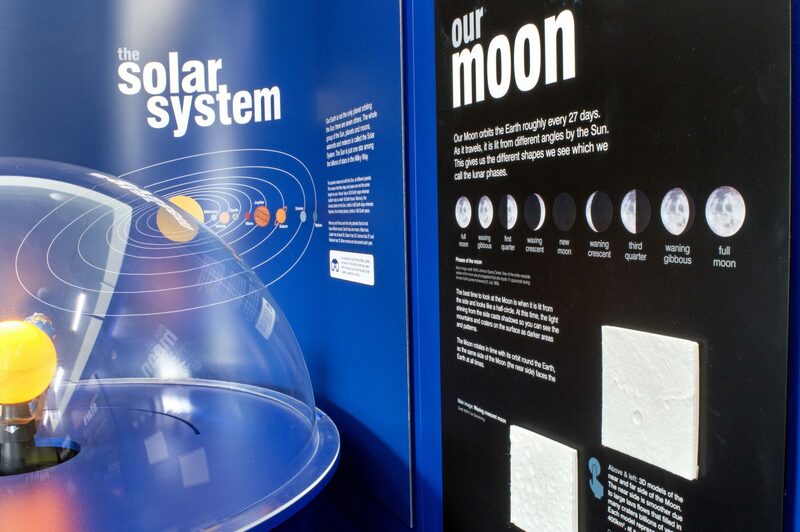 And, one of my favourite exhibits, two panels of touchable moon-surface 3d printed from NASA files! Most people involved in Science Communication know NASA has a great resource of education materials, however until this year I didn’t know about their 3d printing files…. here’s the link if you’re interested – http://nasa3d.arc.nasa.gov/models/printable – these files can be printed for free by anyone with a 3d printer. Ours show the near and far sides of the moon and how these differ (the far side is very cratered whereas the nearside is smooth due to lava flows that filled the craters billions of years ago). A texture difference like this is a perfect use for a touchable model. Kielder Water and Forest Park is a fantastic place to spend time outdoors, to learn about forestry and hydroelectric power generation, as well as ecosystems and nature. Now I’m pleased to say it’s also a great place to find out about stargazing. Collaboration with inspiring clients, designers, builders and other freelance colleagues is one of the greatest joys of my work. Please use this form if you’d like to get in touch. Whether you think I can help with potential projects, ideas, or just for a chat. Connect with me on Social Media for updates and topical content. Click below to find me on twitter and vimeo.